What is County Lines and Child Criminal Exploitation? County lines is the term used to describe gangs and organised criminal networks involved in exporting illegal drugs into one or more importing areas within the UK, using dedicated mobile phone lines or other form of ‘deal line’. They are likely to exploit children and vulnerable adults to move and store the drugs and money, and they will often use coercion, intimidation, violence (including sexual violence) and weapons. Child Criminal Exploitation is where an individual or group takes advantage of an imbalance of poer to coerce, control, manipulate or deceive a child or young person under the age of 18 into any criminal activity (a) in exchange for something the victim needs or wants, and/or (b) for the financial or other advantage of the perpetrator of facilitator and/or (c) through violence or the threat of violence. The victim may have been criminally exploited even if the activity appears consensual. Child Criminal Exploitation does not always involve physical contact; it can also occur through the use of technology. Gangs establish a base in the market location, typically by taking over the homes of local vulnerable adults by force or coercion in a practice referred to as ‘cuckooing’. The National Crime Agency have published ‘County Lines Violence, Exploitation & Drug Supply 2017 National Briefing Report (November 2017)’ providing a national overview on the threat of ‘county lines’ drug supply, violence and exploitation. It supports Home Office, NPCC and wider stakeholder priorities including those of the Ending Gang Violence and Exploitation (EGVE) programme. In particular, this report contributes towards the EGVE objective of ‘Tackling County Lines’. How does it affect young people and vulnerable adults? is typified by some form of power imbalance in favour of those perpetrating the exploitation. Whilst age may be the most obvious, this power imbalance can also be due to a range of other factors including gender, cognitive ability, physical strength, status, and access to economic or other resources. A young person’s involvement in county lines activity often leaves signs. 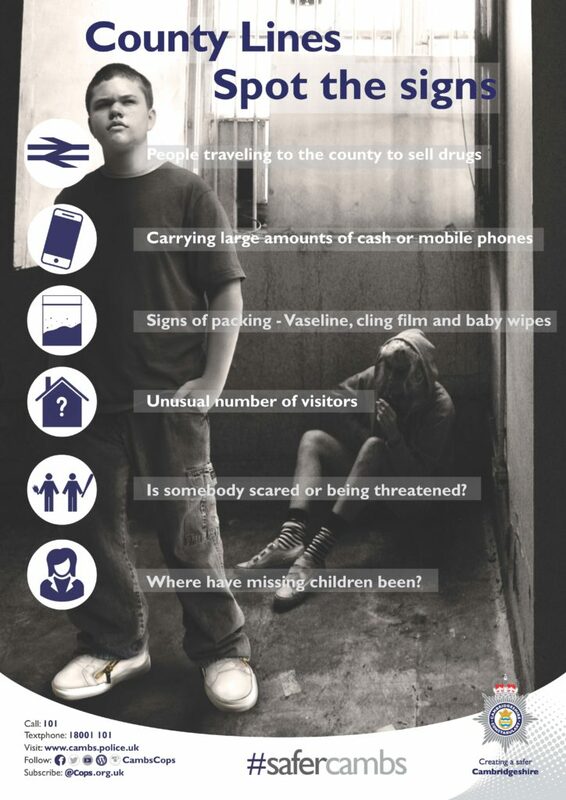 A young person might exhibit some of these signs, either as a member or as an associate of a gang dealing drugs. Any sudden changes in a young person’s lifestyle should be discussed with them. Cambridgeshire on 0345 045 5203 (Open 8am – 5:30pm Monday to Thursday; 8am – 4:30pm (Friday).